A dog is not a pet but a part of the family. In fact, he’s a big part of the family. He’s the one that’s loved, pampered and spoilt, he’s the one that everybody else’s sleep patterns are adjusted, and he’s the one you immediately rush over to the vet’s even at the slightest signs of discomfort. So what do you do when your baby grows old and you fear losing him forever? Well, to be honest you can’t do much but sit and wait. 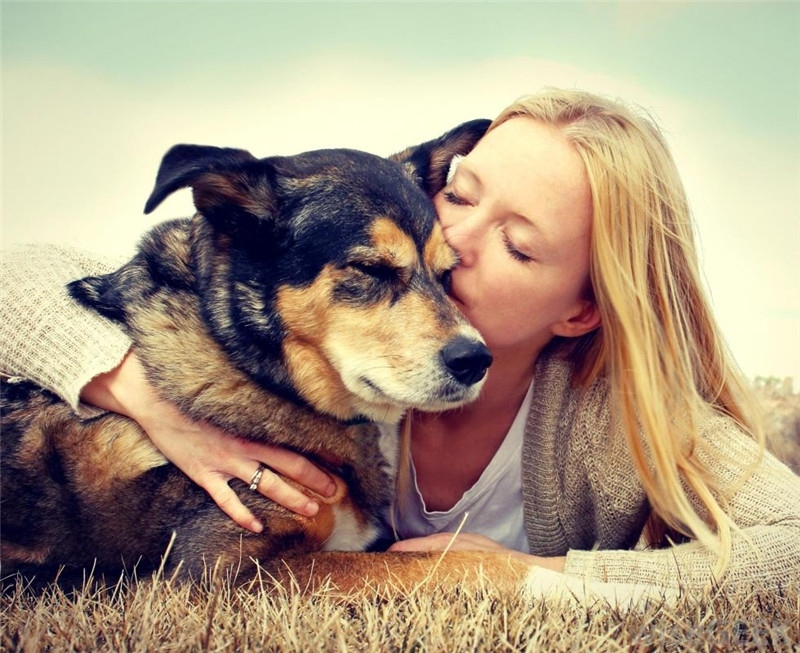 But knowing the signs that your dog is dying can be helpful in making his last days as comfortable as you can. So which signs should you keep an eye out for? Know that, by themselves, a lot of these signs can be caused by other medical issues, but when clumped together, they’re a cause for concern. It's difficult for older dogs to maintain proper hand-eye coordination, and they will often walk unsteadily or have great difficulty in moving from one place to another. He may also be disoriented and may even shake when lying down. In such cases, keep him comfortable in a quiet corner of the room. With old age come fatigue and exhaustion. So while up until a few months ago your dog was very happy and active, you’ve found that now the same walk which he could do for 15 minutes straight tires him only after 4 minutes. Prolonged uneven breathing is not a good sign. The digestive system of an older dog starts shutting down, which means that the food he eats cannot be properly ingested. It will instead make him feel nauseated and even begin vomiting. This begins gradually, and one fine day you may realize that he’s lost all his appetite for food and even water. Dogs are very smart. Most of them know when their time is near, and they tend to stick to people they love the most during their final days. So if you think your dog is being unnecessarily clingy, don’t dismiss that. The twitching of the body is an involuntary response, which can even result in shaking of various body parts. As is the case with humans, progressing age in dogs brings mental confusion. In extreme cases, he might not even be able to recognize the people he loves. Old dogs do not have the time and energy to put up with loud noises or constant activities. They just want a quiet and cosy place so that they can live their final days in peace. You will notice him doing nothing but lying in one spot all day long, not showing interest in his favorite activities, food or even the people that he loves. Keep an eye on your pet. If he is spending lots of time in a place where he typically doesn’t go, then this is probably one of the signs your dog is dying. Old dogs lose more and more control of their bodily functions as they grow older. One effect of this is losing control of the muscles that control his bladder. Thus, you may find him peeing when he’s lying in bed and unaware what he has done. You’ve been with your dog for over a decade and you know when something’s off, right? That twinkle in his eyes every time you petted him is gone. It has now been replaced by a dull stare. Your dog isn’t a pup anymore – he’s old, slow and in all probability, being annoying. But it’s not his fault if his body is giving up on him, is it? If taking care of your dog is kind of annoying you, imagine what the poor dog is going through! So don’t be frustrated. Call him a good boy, and reassure him in soft and comforting voices. Pet him, hug him and stroke his body. Do whatever it takes to make him feel at ease. Put in a pair of extra blankets to make his bed softer than usual. Elderly dogs are prone to pressure sores, so either turn him on alternate sides every few hours, or buy and add extra cushioning to the bed. If possible, sleep next to his bed in a sleeping bag if he shows signs of distress. If your dog has problems with incontinence, you can do one of the two things: either purchase or make doggy diapers and change them every a few hours; or, choose a convenient location in your home preferably near the bathroom so you can immediately take care of any accidents. Talk to your vet, have your pet diagnosed and find out if he’s in pain. If he is, give him medicines so that you can ease his pain. If there are signs your dog is dying and your vet confirms that, you should consider euthanasia to end his pain and make things easier on his side. It’s no secret that your dog hates the vet’s office. So why not pay the vet a little extra and bring him home so that your dog can be euthanized in an environment he’s comfortable and happy in?